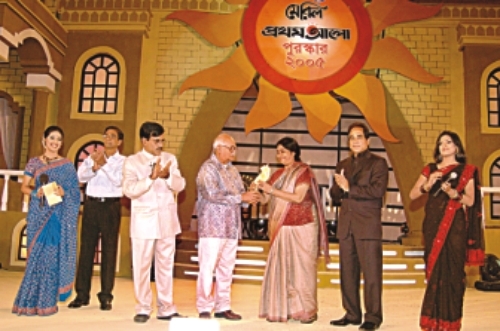 The Meril-Prothom Alo Awards for 2005 were handed over to the winning singers, models, and TV and film artistes in a colourful programme yesterday. Noted stage and TV artiste Ferdousi Majumdar received a crest and a cheque for Tk 50,000 for lifetime contribution to art and culture. Prof Zillur Rahman Siddiqui, former adviser to caretaker government, handed over the award at the beginning of the programme at Bangladesh-China Friendship International Conference Centre in the city. Shibli Muhammad received the award as the best dancer and Munir Khan as best music critic. Abdullah Rana was awarded as the best TV drama director while Muhammed Zafar Iqbal as the best TV dramatist. Ali Zaker received the award for the best TV actor and Shami Kaiser the best TV actress. The film 'Hazar Bachhar Dhore' received the best film award and its producer come director Kohinoor Akhter Suchanda the best director award. Reaz and Shashi, actor and actress of the same film, received the best actor and actress awards. According to a viewers' opinion poll, Asif won the award for the best male singer while Samina Chowdhury the best female singer. LRB was adjudged the best musical band. Hanif Sangket won the award for the best television magazine, Chancal Chowdhury the best male model, and Deeghi the best female model. Besides, Mahfuj Ahmed was awarded as the best TV actor, Api Karim the best TV actress, ATM Shamsuzzaman the best film actor, and Shabnoor the best film actress.